When I was young, I learned to wrench on a Baja Bug. That little VW bug was all I had to get to work and school but I really wanted to build it for bombing down old logging roads. I would tear it apart Friday night and then work like hell to get it all back together by Monday morning. Soon I got cocky and figured I could go out partying Friday and Saturday night then do an oil change or swap out shocks on Sunday. After all, it only takes a couple of hours and what could go wrong! Inevitably on Sunday night after all the parts stores were closed and the local VW shop guys were long gone… I would unexpectedly break something (as opposed to expectedly braking something)… Shear off one of the bolts that holds the oil cover to the bottom of the engine block or rip the gasket for the oil cooler or loose one of the four bolts that holds the engine to the transmission (all true stories). The great thing about VW Baja Bugs is that you can hold them together with duct tape and bailing wire for a couple of days until you get the part you need… and almost anything can be fixed for very little cash. But after any number of these little episodes I came up with one simple cardinal rule… Never wrench on a Sunday! Start on Friday or Saturday and only plan to work on the stuff that can be completed by the end of the day Saturday… Even if that is midnight… Plan on finishing before Sunday. The simple reason for this rule is that if something goes wrong I have Sunday to fix it. This last Sunday I decided to change the spark plugs. Saturday had been a good day wrenching, re-installing our HID flood lights, changing the cabin air filter and rotating tires. I had purchased spark plugs but Hula Betty suggested dining out, so I called it a day before getting to the spark plugs. I’ve performed a spark plug change a number of times without ever having a problem… Even worked up a spark plug video to help others. After getting the rig on the road and opening it up… The rig sputtered and lugged when it hit the hills. It was lurching as if not all the plugs were firing or the timing was off and for a moment the dashboard Christmas tree lights started flashing. This was not good and now it’s 6:00 pm, dark, starting to rain and the engine is warm (you change plugs on a cold engine). I checked to see if all the vacuum hoses had been re-connected, tugged on the ignition coil wire harness and looked for anything dangling… nothing obvious. Now the parts stores are closed and I have no way to get to work until I get the rig back up and running. 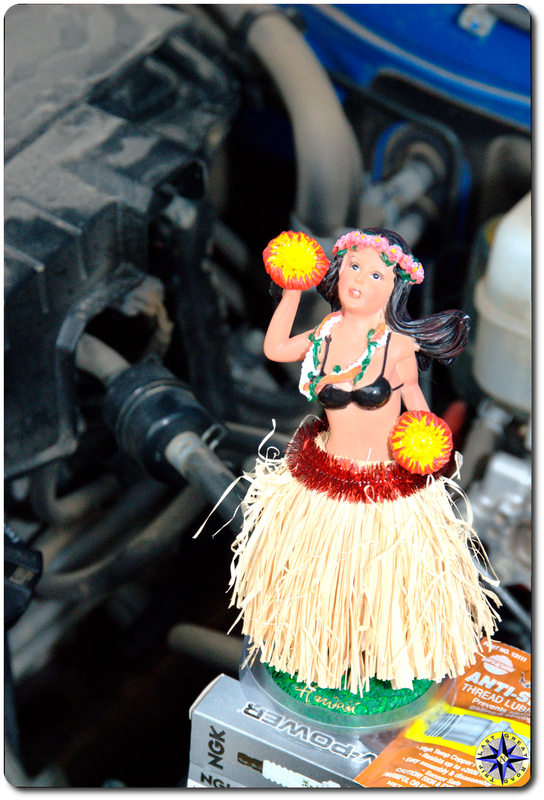 Monday, I grabbed Hula Betty’s car and picked up another set of plugs. Pulled out all the tools, double, triple and quadruple checked the gap, applied anti-seize and dabbed on a little dielectric grease to the coil boots. Then as I changed out the plugs… I looked at each plug as it came out to see if there were any noticeable things I’d missed the first time. I checked their gap and looked for damage. Putting in the new plugs I followed the same process of torquing down to spec. and listening for the click as the wire harness engaged. And when it came time to test everything with a drive around the block…. dramatic pause goes here to build a suspense… the engine ran like a champ! Climbing the hills was easy and the rig maintained smooth even acceleration through the power band. So what happened… I don’t know… but most likely the gaps were off a bit, or one of the ignition coil’s wire harness had not quit engaged or their was just a bad plug. Any of which I could have easily dealt with on Sunday had I run into the issue Saturday night. Instead I wrenched on Sunday, braking my cardinal rule and cost me Monday’s wages. But it did feel good to get it right… even if it was on the second try. Change is what Buddhism is all about. But this is an off-road adventure not a centuries old philosophical approach to life… Or is it. What follows is an evolution in our quest for the perfect suspension. 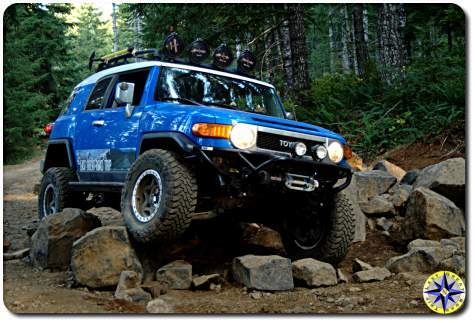 Back in late 2006 we purchased the Blue Bunny, our early 2007 Toyota FJ Cruiser, one of the first to hit the west cost. On a warm sunny fall day we drove it off the lot in Portland, headed back up to Seattle and fell in love… Thanks to the independent front suspension (IFS) the FJ Cruiser’s ride is smooth. The 4.0-liter 1GR-FE DOHC V6 engine puts out loads of torque and horse power. The 2 speed transfer case, rear locking differential and A-trac traction control system make the FJC a pack mule that will go up and down most 4×4 trails right out of the box. But we don’t travel down most 4×4 trails… and so our quest began for a smooth riding mountain goat that will go just about anywhere and remain dependable enough to get us there and back without a team of mechanics and a fleet of chase vehicles… Not that we wouldn’t like a traveling pit crew… we just don’t have it in the budget. The first thing we needed for our adventures was added ground clearance and the ability to soak up miles and miles of washboard roads. A common misconception is that a lift kit gives you ground clearance. That is not true. A lift allows you room to put on larger tiers and it is the taller tiers that deliver ground clearance. So our goal was to lift the rig as little as possible, keeping our center of gravity low, while allowing us to stuff 295x17x70 Toyo mud tires into the wheel-wells with enough space for travel up and down. 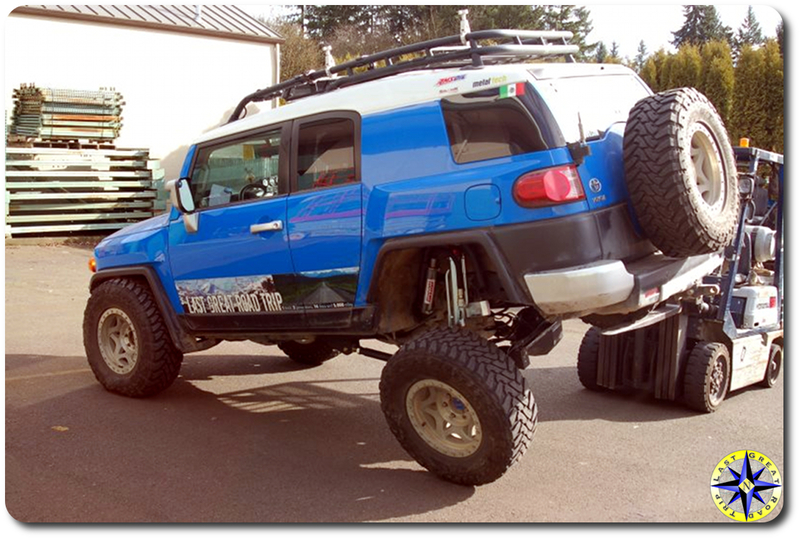 We considered our FJ Cruiser lift options and decided on a suspension lift that would maintain the smooth IFS front travel rather than swapping to a solid axle aimed for more purpose built rock crawling. 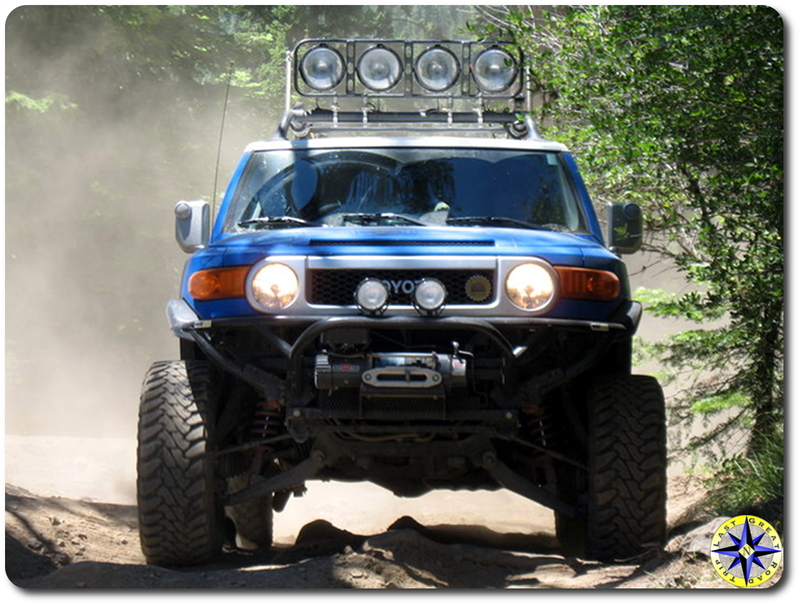 In order to reach our ground clearance goal we started out with a 3″ Sway-A-Way suspension lift front and back. 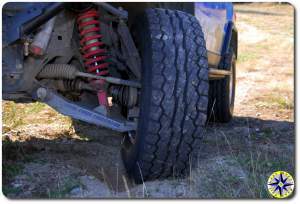 The Sway-A-Way coil-overs can be individually adjusted allowing us to dial in the pre-load to compensate for the added weight of bumper, winch and any winter weight the driver might be carrying. The lift allowed us to stuff our tires into the wheel-well giving us the clearance we were looking to gain. Over the next year and half we explored our way up to the Arctic Ocean and wheeled local trails working on off-road driving skills in order to take our adventures to the next level… Through out this time our 3″ lift met all our needs. As our desire to explore further grew, ground clearance was no longer enough. We wanted to add travel and increase the capabilities of our rig as it travels over washboard dirt roads and boulder filled trails. In order to pick up the travel we were after, we choose a Total Chaos front long travel kit. The kit achieves it’s additional travel by pushing the wheels out 2″ further on each side making room for longer coil-overs. On our rig we kept the lift at about 3″ and took the gain in travel through droop (wheel falling down). The additional droop keeps the wheels on the ground over all sorts of terrain as the rig rides smooth across it all. The added travel proved invaluable when we tested it on our Rubicon off-road adventure. While the front travel jumped from a stock 7.81″ up to about 12″ with the long travel kit, the rear with it’s 3″ lift was stuck at around 9″. Although impressive numbers, running down the Baja it became clear that the rear end, with its 2″ diameter shocks and original factory geometry could not keep up with the front end or the demands of our Baja off-road adventure. So here is where we are going in our evolution… Introducing the Metal Tech rear long travel. The FJC comes from the factory with a five point rear suspension. 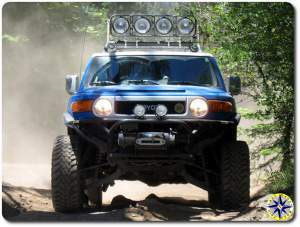 Metal Tech offers their FJ Cruiser Rear Long Travel Suspension Package – Stage 2 package which ups the shock travel to 11.5″ and allows the wheel to move 27″ from top to bottom. Ask anyone and they will tell you Metal Tech makes great stuff and their kit is better than anything else on the market. But we’re looking for a bit more custom solution so we’ve asked Metal Tech to engineer a solution that will be able to take us to the top of the world. We plan to start with Metal Tech’s progressive rear springs. Their springs stand 19 1/4″ high but allow you to maintain a rig height the same as a standard 3″ lift. Metal Tech has engineered a progressive rate into their spring that allows for soft supple expansion that gives more flex when needed while the stiffer section maintains lift and support. Remember our goal, lots of travel while keeping the center of gravity as low as possible… Well we didn’t forget and neither did Metal Tech. We are also going to utilize Metal Tech’s three link suspension system (although its is 4 when you count the pan-hard bar which we’ll maintain daily driving, although who knows… LT is talking about swapping it for a torsion bar. Metal Tech uses 2″ x 3/8″ wall DOM tubing for their links and then mounts them to the frame using 1/4″ and 3/8″ plate to protect the ends. 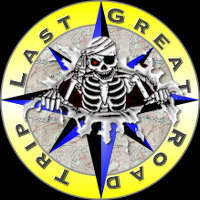 If you’ve ever bought anything from these guys you know it is all about the steel. They specify that the steel their suppliers provide, meets their requirements for tensile strength and hardness to ensure its ability to take the punishment that wheeling delivers. In order to control the up down oscillations as our rig bombs down the trails we’ll be installing 2 1/2″ diameter, 12″ travel, remote reserve, 3 tube by-pass Sway-A-Way shocks. If you ask us why we are choosing these shocks we’d tell you… A single 2 1/2″ diameter shocks is comparable to the performance of dual 2″ diameter shocks. The by-passes will let us fine tune our shocks’ compression and rebound in order to compensate for different terrains and loads as we go from daily driver, to 4×4 trails to all out expeditions. 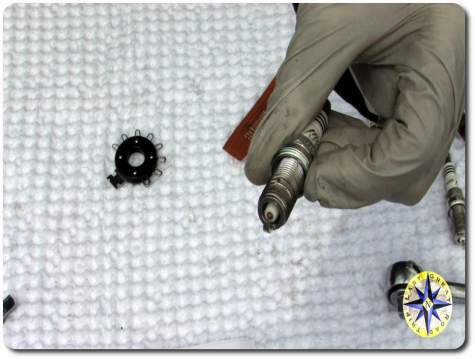 Shocks benefit from a large external reservoir that offers the greatest oil of volume. The oil flows freely between the shock body and reservoir through a flexible high pressure hose, providing excellent heat dissipation and preventing fad during a long, hard day on the trail. To ensure we have enough room for the larger shocks we’ll be relocating them to outboard hoops that let us squeeze out every bit of the 12″ travel. And why are we choosing Sway-A-Way? We need to know we can count on our shocks through any terrain and Sway-A-Way has proven themselves to us since our initial 3″ lift… It’s all we’ve run. Their quality and toughness have performed when we needed them most. Metal Tech has spent significant time working out the geometry to ensure our rig will have the proper squat and anti-squat needed to maintain proper handling. LT has also worked out the spacing requirements for those bigger rear shocks and dialed in their springs to take advantage f all that travel. But suspension is only part of the story… we’ll also address the need to improve the transfer of horse power down to the wheels and keep them all turning. We have plans for that as well… but that’s another post.